Bilstein 5165 Remote Reservoir Offroad Racing shocks are now available for custom applications. Using the same technology as the Bilstein 5160 series bolt-on remote reservoir shocks, the Bilstein 5165 series offers race-ready offroad racing shocks in a variety of sizes for custom applications. Bilstein's 5165 monotube offroad racing shocks use Bilstein's patented digressive valving to provide full damping power immediately, giving you more control and performance than any other shock. The remote reservoir in the Bilstein 5165 offroad shocks increases heat dissipation to avoid fade and give you full performance no matter how hard you drive. The Bilstein 5165 offroad shocks use a dividing piston located in the remote reservoir of the shock so that nothing in the shock body limits piston travel, giving you more wheel travel. Bilstein 5165 offroad racing shocks are designed for custom applications and lifted trucks, so you are responsible for ensuring that your shocks are the correct length before placing an order. The Bilstein 5165 shocks come with standard 5/8 inch bushing mounts on both ends unless otherwise noted. 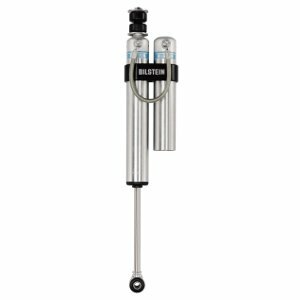 All Bilstein 5160 shocks include a reservoir mount. 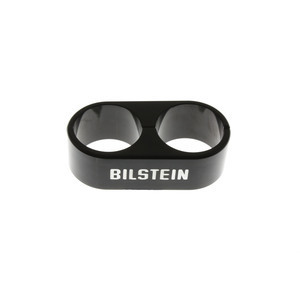 A Bilstein 5160 Billet Reservoir Clamp (as seen above and pictured below) is also available.